Use tempeh to create meat-like Swedish meatballs. Today's vegetarian cooks have a variety of "meat" replacement options when it comes to creating a great vegetarian Swedish meatballs recipe. One of the most important aspects of a vegetarian recipe is texture, especially when it comes to entertaining your more carnivorous friends. For many people, Swedish meatballs is one of those recipes that takes you back to the home cooked meals of childhood, or perhaps even back to your grandmother's kitchen. Thankfully, it is easier than ever to transform your favorite recipes into today's meatless meals. There are many different types of meat replacements on the market today. Some work better than others for shaping into a meatball form. Tofu - Perhaps one of the most well-known of vegetarian options, tofu is usually sold as a silky block of soy protein. It can be chopped into bite size pieces and will take on the flavors of whatever dish you choose to make. This makes it a great meat replacement in stir-fry and baked casseroles, like lasagna. Unfortunately, it is not the best choice for a dish that requires a round "meaty" ball. Ground "Beef" - Also a soy product, vegetarian ground beef is made using textured vegetable protein. This texture makes using these "beef" crumbles an excellent option for vegetarian Swedish meatballs. They are also a great protein to use in any of your recipes that call for ground beef, from meatloaf to spaghetti. 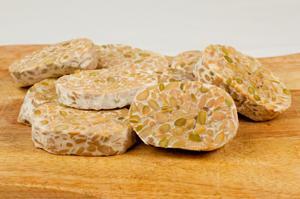 Tempeh - Tempeh is also a soy product, but unlike tofu or other soy proteins, it remains a whole soybean product. This means it has a higher protein and fiber content, making it an excellent choice for meals that require a dense protein texture. Unlike tofu, tempeh has a distinct nutty flavor. While it certainly can be soaked in a marinade of your choice, it does also add flavor to a recipe. Before you get to shaping those meatballs, it is important to figure out what kind of sauce you want to use in your dish. An experienced cook knows there is rarely just one way to create a traditional dish, and since you are not using meat in this recipe, you don't need to stick to tradition anyway. Cream Soups - Perhaps one of the easiest ways to create sauce is to use cream soups. They come in a variety of flavors, like celery, and potato with low fat and low sodium options. One of the best flavors to use for this particular dish is a nice cream of mushroom. This is an especially good option if you plan to serve this meal with mashed potatoes. You will need two cans for the recipe included below. Dry Soups - Dry soups, which usually come in a box or packet at the grocery store, allow you to create a thinner, more liquid sauce for your meatball dish. If you are going to serve this meal with noodles, a dry soup may be the way to go, because a thinner sauce will go a little further when it comes to saucing the noodles. You will need only one packet of dry soup mix for the recipe below. Dry onion soup or dry mushroom soup both work. Sauce from Scratch - If you have an old family recipe for a good onion or mushroom sauce, it can easily be retooled for a Swedish meatball recipe. In fact, the same sauce you use to smother your mashed potatoes can be used in this dish. Using your own sauce can give this meal a truly personal touch that your guests or family will really love. Try this version that uses ground "beef" and cream of mushroom soup. 1 lb vegetarian meat replacement - Use ground "beef" or tempeh for the best results. 1 tbs soy sauce - For a healthier dish, use reduced sodium soy sauce. 4 tbs oil for cooking - Olive oil is considered one of the healthiest oils for cooking. In a medium bowl, mix meat replacement, soy sauce, garlic powder, and egg until well combined. Form mixture into two-inch round balls. If mix is too dry, add in one tablespoon of oil, preferably extra virgin olive oil. Heat oil for cooking in a medium pan, and brown the meatballs on all sides. Mix all sauce ingredients in a bowl. No need to heat on the stove. Spray a 9 x 13 inch glass baking dish and pour in half of your sauce mixture. Place meatballs on top of the sauce, about one inch apart. Top meatballs with the remaining sauce mixture. If you plan to use a dry soup mixture, prepare the soup per the directions on the package. To thicken, use one to two tablespoons of corn starch. Whisk well before pouring mixture into your baking dish. With the many options available to vegetarian cooks today, creating a tasty no-meat meal is simpler and tastier than ever before.